The ultimate suit hanger made from strong hardwood, with a natural varnished finish that will look stunning in any wardrobe. A wishbone design, chunky contoured neck, and oversize shaped shoulders not only allow for superior presentation of garments, but they aid in providing vital support to your clothes in all the right places. Providing your clothes with the correct support reduces stress on clothing and stops seams and stitching from deteriorating; therefore prolonging the life of your garments. Complete with a beige, velvet, non-slip trouser bar that is gentle on your clothing; it won't snag your clothes which causes loose threads, and it prevents garments from falling on the floor gathering dirt & dust; the thick tubular design also minimises creasing at the trouser fold. The attractive gilt metal 360° swivel hook allows the hanger to be positioned in any direction. 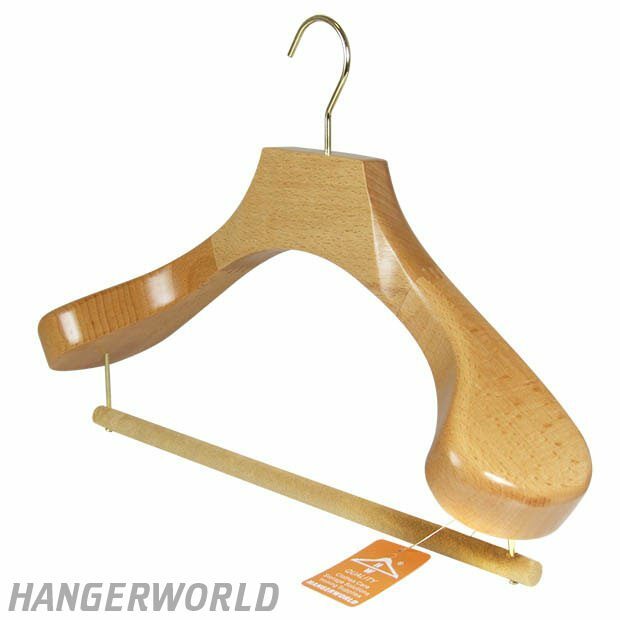 Quality garments deserve the best in clothes care; you won’t find anything that provides better shape, support & sophistication than this luxury hanger. Ideal for hanging suits, trousers, jackets, & coats. Wishbone design, contoured neck & broad shaped shoulders. Beige velvet non-slip trouser bar. Gilt metal 360° swivel hook.